Take UPPER LEVEL of Verrazano Bridge to Staten Island Expressway. Continue on Staten Island Expressway to Todt Hill / Slosson Avenue Exit 12. Make a left at first light off the exit onto Slosson Avenue, this becomes Todt Hill Road after the overpass. Continue on Todt Hill Road to Richmond Road. Make a right onto Richmond Road. Take Richmond Road to New Dorp Lane, make a left. We are located on the left hand side of New Dorp Lane, directly across from the Municipal Parking Lot. Take Staten Island Expressway to Todt Hill Road / Slosson Avenue Exit. Make a right at first light off of exit onto Todt Hill Road. Continue on Todt Hill Road to Richmond Road. Make a right onto Richmond Road. Take Richmond Road to New Dorp Lane, make a left. We are located on the left hand side of New Dorp Lane, directly across from the Municipal Parking Lot. When exiting Ferry, follow signs for Staten Island Rapid Transit. Take the Local Train nine stops to New Dorp Station. Exit onto New Dorp Lane and make a left. We are located approximately 200 yards from the train station directly across from the Municipal Parking Lot. Take the #79 bus from 86th Street & 4th Avenue, Bay Ridge. Transfer to the Oakwood Mill Road bound S76 and get off at New Dorp Station stop. We are located approximately 200 yards from the New Dorp station on your right, directly across from the Municipal Parking Lot. Take the x1, x2, x3, x8, or x9. Transfer to the Oakwood Mill Road bound S76 and get off at New Dorp Station stop. 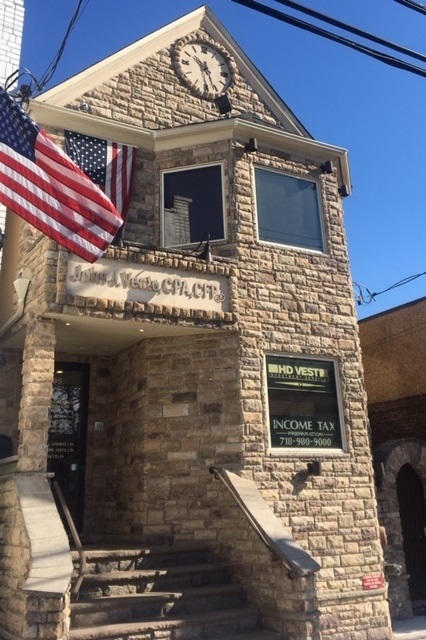 We are located approximately 200 yards from the New Dorp station on your right, directly across from the Municipal Parking Lot.